Hi all! Today I have a card set made that I’ve wanted to do for a loooooooooong time! I got the Folk Art Medallion stamp set a while back, but was never able to get a really solid, perfect image from the big medallion stamp. Now with my MISTI, every one is perfect! I stamped some of this on the MISTI, and some with blocks, and I filmed the process. There are also a couple tips on stamping with difficult images. Hope it helps! 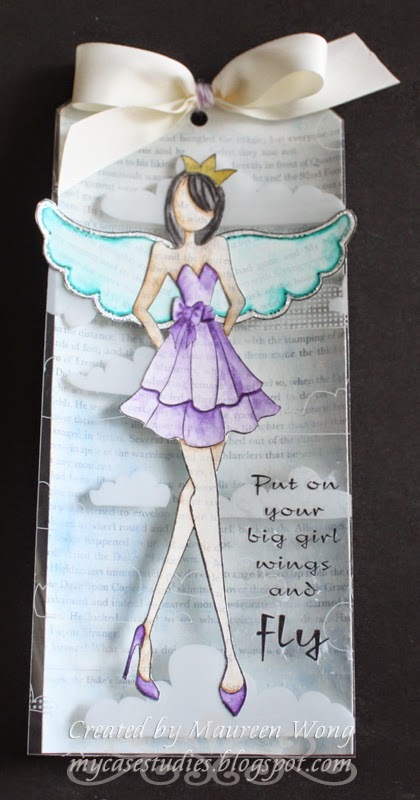 This is also for Cute Card Thursday – Stamping Mad (use a stamp) and SSS Wednesday Challenge – Anything Goes. TFL! This is also for Noor Design UK – With Love. I hope you like it and TFL! I cut 2 pieces of cardstock and covered them with sheets from an old book. One was cut into a tag shape, and on the other I stamped the doll and wings. I colored them with Inktense pencils, added some Stickles to the wings, and fussy cut them out. I cut out the same tag shape from some cloud transparency I had in my stash and tied it to the book sheet tag with a twill bow and some baker’s twine. For the sentiment, I printed it on plain paper with my laser printer and covered it with clear packing tape. Then I soaked it in water and rubbed the paper off the back of the tape. That leaves just the toner sentiment on the back of the tape and it stuck right to the transparency. This is for SSS Monday Challenge – Up in the Clouds. I hope you like it and TFL! I used the PI Sending Big Hugs stamp set and the matching die. She was stamped with Memento ink, colored with Copics and her dress was paper pieced. The sentiment is also from the stamp set. This is also for Crafty Creations – Something Old, Something New (the paper is really old from my stash and the stamp set and die are new to me). I hope you like it and TFL! P.S. This is also for SSS Wednesday Challenge – Have a Heart. I also used the Love & Smiles stamp set and the matching die set. Here’s what it looks like after the tab is pulled and the gift card is pulled out a little. Be sure to check out the YNS Blog to see all of the other projects and comment for a chance to win a stamp set of your choice! TFL! I used the Everyday Classics set from Papertrey Ink and followed the Make It Monday instructions for pieces behind the heart. I cut out a 3x4 journaling card and cut out a Spellbinders heart from it. I stamped a sentiment near the bottom, then adhered the pie chart piece to the back of the card and cut the excess off. I embossed a blue cardstock piece with a Stampin’ Up! dot folder and put the whole card together. This is for Crafty Creations – Blues and also Daring Cardmakers – January Blues. I hope you like it and TFL! I just got my MISTI Stamping Tool and I have to say that it really is the Most Incredible Stamping Tool Invented! I used it on this card to stamp the sentiment exactly where I wanted it on the card base and on the watercolored panel. Then I mounted the watercolor panel on the card base with foam tape, and the sentiment lined up perfectly! This is for SSS Monday Challenge – Inky Background and the sketch is from CAS(E) this Sketch. I hope you like it and TFL! I used a few MFT products on this card: Heart Full of Love TRANSFORM-ables, Sheet Music Background, and Hugs & Kisses Cover Up die. This is for Color Throwdown – red, white, and black. I hope you like it and TFL! This month, our Dare was to make a Clean & Simple card using the colors white and red. First I stamped the Heart Ink Splatter in red on a white card base. Next, I cut the Fancy Thanks Die 3 times from white cardstock scraps. I glued them together and adhered to the card, slightly over the splatter. This card is also for the Virginia's View challenge – Clean Slate. Don’t forget to check out the YNS Blog to see all the other inspiration from the DT and comment there for your chance to win! TFL! I used the Perfect Chemistry stamp set and the matching die set. I stamped the test tube guy with Memento ink and colored with Copics. Then I die cut him out and popped him up on the panel with foam dots. The sentiment was stamped with Versamark and embossed with Hero Arts white EP. I hope you like it and don’t forget to click over to the YNS Challenge Blog to see all the details and inspiration from the team! TFL! I used the Framed Lovebirds Die-Namics, Hugs & Kisses Cover Up, and a sentiment from PI Sending Big Hugs. I also used the hemp cord from MFT and the sentiment tag is from Blueprints 18. Hi all! Welcome to the January 2015 New Release Blog Hop for Your Next Stamp! You should have arrived from Laura’s blog, but if you just happened across this post, then please go back to the beginning (Carole’s blog - links are at the bottom of this post) because you won’t want to miss a stop! I’m so excited for this release!! I designed the Spring/Summer Scene die set and I also designed an SVG matchbox that’s designed to go with the Key To My Heart die set! I *love* hearts so this is a favorite release of mine. I was thrilled to see the Heart Ink Splatter stamp – SO cute!! Anyway, that’s enough talk, let’s get to my projects! I also used the tree trunk/branch and clouds from the Spring/Summer Scene dies. And the SVG file is FREE with the purchase of the Key To My Heart die set If you have any problems with the file, please email me directly instead of leaving a comment. Thank you. As always, there is a hop prize to be won – one commenter will be drawn from all the comments on all the blogs in the hop to win a $20 Gift Certificate to YNS!! So the more blogs you comment on, the better your chances of winning! And of course there’s a sale as well! Your next stop is Wendy’s blog, but don’t forget to leave me a comment before you go! The fun thing is when you flick him a little, he moves! Fun! This is also for the SSS Monday Challenge – Old and New (I used new stamps and dies with some very OLD patterned papers). Now it’s time for you to head over to the YNS Blog to see all the DT members that have a sneak peek for you today. I hope to see you back here tomorrow for the New Release Hop! TFL! I used the Fruit Trio die set and generated the sentiment on my computer. The patterned papers are from Doodlebug’s Fruit Stand.